Preparing a lesson on Ash Wednesday and Lent for yesterday’s 3rd grade religious education class clarified my own discernment for Lent this year. Growing up, Lent for us was usually about giving something up, like soft drinks, and abstaining from meat on Fridays. 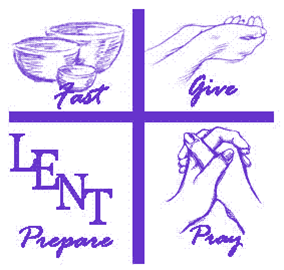 We were not aware of the other two pillars of Lenten observance, almsgiving and prayer. Looking back, I feel as if I missed so much potential spiritual growth during those teenage and college years. Teaching my 8 and 9 year olds yesterday in faith formation, I wanted them to realize Lent is more than saying no to dessert for 40 days. Lent is a time for us to change our lives and grow in holiness. Through fasting (giving up), almsgiving (giving to others) and prayer, we endeavor to develop a closer relationship to God. Our 40 days should be filled with reflection, service and prayer. Explaining Lent to my class and answering their creative questions made me ponder more deeply the things I have chosen to do in observance of Lent. My list of Fasting items revolve around time-consuming habits, causing me to question the true purpose of each fast. How are the things I want to give up for 40 days going to help me develop a closer relationship with God? Will my fast encourage me to avoid the near occasion of sin? Will abstaining from these activities lead me to become a more faith-filled person? Facing these difficult questions and answers leads me to pray further about my choices. When our class discussed Almsgiving, the kids immediately thought of giving money to charity. While acknowledging that fiscal donations are a great service to others, we also discussed more direct ways to help our fellow man. The aim through almsgiving is to love others as Jesus loved us; to live our profession of faith not just through our words, but also through our actions. Almsgiving is a time to heed a call for change in our lives. Even simple ideas, can lead to profound impact; such as, stop complaining, volunteer for an organization, visit or contact my elderly relatives more often, take a meal to a sick neighbor, or focus on loving others rather than criticizing them. The pillar I most overlooked in my youthful observance of Lent was Prayer. As an adult, it is the aspect I now spotlight the most, though I admit it is the part of Lent I am least successful at observing. It is been my tendency to go overboard and commit to too many things; however, this year, I am pairing down and focusing on a few big devotions. Since I did not focus on prayer during Lent as a child during, it is my favorite part to share with my children now. There are so many wonderful ways to encourage my children towards prayer during Lent it can be overwhelming. This year we are choosing a couple that the children seem interested in, such as learning to pray the rosary together, and add the few we loved from last year, such as posting new prayers on their bathroom mirror. We are not called to do only one, but all three pillars to prepare our hearts for Christ on Easter. Lent has grown to become one of my favorite times on the liturgical calendar as I am reminded of humility and sin. This is a special time to reflect on God’s grace and change ourselves to become as God calls us. Only through God's grace and mercy will we make it to our ultimate goal of heaven.